Located in Ohio, Pennsylvania, West Virginia, Indiana and Maryland; Giant Eagle is retail grocery chain known for low prices and excellent customer service. Guests are able to purchase high-quality produce, meat, seafood, and bakery goods seven days a week. In addition to selling fresh food items and quality products, Giant Eagle also offers customers a variety of services. The financial services offered in Giant Eagle are often utilized by customers who are unable to visit their bank during normal business hours. Financial products offered include check cashing and the ability to purchase a Giant Eagle money order. Below you will find important information about Giant Eagle Money Order. Giant Eagle works with Western Union to provide money transfer and money order services. Shoppers who purchase a Western Union branded money order at Giant Eagle can use their money order to purchase anything within the United States. Giant Eagle money orders are available for purchase at the money center or customer service desk during normal business hours. At this time only cash and debit cards are acceptable forms of payment. The typical money order limit at Giant Eagle is $500.00, but some locations will sell money orders in amounts up to $1,000.00. Each money order transaction is charged a fee of $0.99. 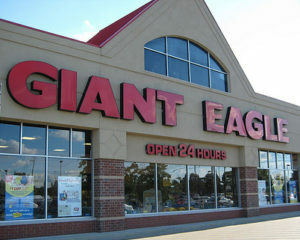 To find a Giant Eagle money order location near you click HERE.